Advantages: Comprehensive reference, section dedicated to modelling the subject. The ultimate expression of a design heritage that dates back to the mid-1940s, the Tu-95 Bear has been a mainstay of Soviet long range aviation and maritime reconnaissance since entering service in 1957. The massive four engine turbo-prop remains to this day a key capability for both the Russian Federation Air Force and the Indian Navy. The latest Warbird Tech Volume from Specialty Press provides an excellent introduction and comprehensive reference on the subject of all things Bear. Volume 43 sees prolific author Yefim Gordon again working with Peter Davison to produce a useful work on the type. Broken down into twelve chapters commencing with the design genesis, it then follows through development and the many sub-variants form the first half. The second half of the volume covers the service history and also has a look at the civilian variants, the Tu-114 and 116. As always include in the centre of the volume are eight pages of colour photos which add to the reference value of the volume. Amongst the final chapters is a detailed technical description of the operational Bear including useful close up photos of the features described. 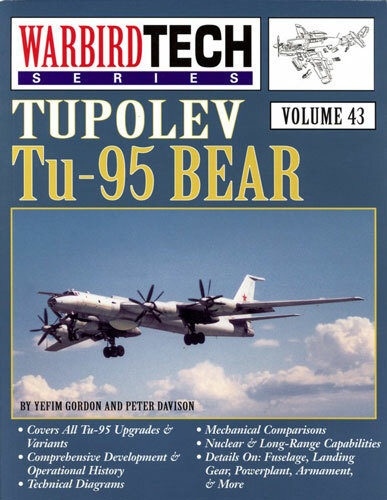 Concluding the book is a short appendix which addresses modelling the Tu-95, which is of direct interest to those who will use the book as a reference for a scale replica. Richard Marmo unsurprisingly starts with a detailed look at the recent Trumpeter Tu-95 kit in 1/72 before addressing the range of kits down to the Dragon 1/200 scale kit. It was somewhat surprising to find that no less than six kits exist of the Tu-95 and derivatives such as the Tu-116. Given most are vacforms though it is likely that most modellers will op for the mainstream Chinese kit. Once more this Warbird Tech volume is of very high quality and a worthy investment for modelling reference. The book will serve both history buffs and modellers well.